Henley Honda | Community | Racing Season is Here for Alex Riley and Henley Honda is Pumped! 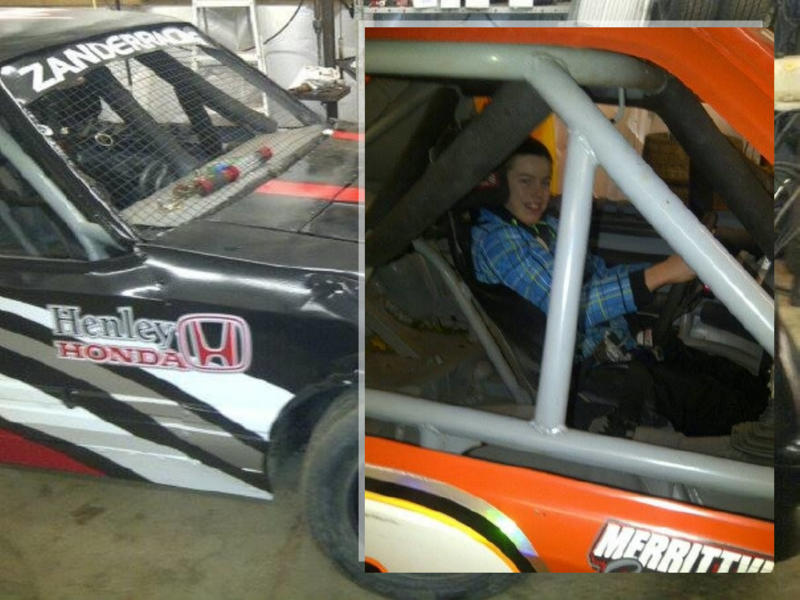 Racing Season is Here for Alex Riley and Henley Honda is Pumped! Next Saturday, May 3, marks the beginning of Saturday Night Racing at the Merrittville Speedway and Henley Honda couldn’t be more excited! It’s more that being excited for some serious local racing — this year, we can’t wait to see Alex Riley make the move from kart racing to the Saturday Night Lucas Oil Weekly Racing Series for 2014! Alex is getting behind the wheel of the former Tony Kelly #12, built by Evan and Baden Curtis. He took part in the Bicknell Racing Products Chassis Seminar and Pete Bicknell Driving School on April 12, but didn’t have the initial results that he was hoping for. He made heavy contact with the front stretch wall and the car is now being repaired, with the intention of having it take to the track on May 3. “When we considered making the move, obviously my first priority was safety,” said Riley’s father Jeff, who got Alex into Kart Racing in 2006. Oh, and did we mention Alex is a Grade 8 student at Monsignor Clancy in Thorold? He’ll be turning 14 just a few days after his first full Saturday Night of racing. For the Rileys, racing has always been a family affair. If you’ve been out to Saturday Night racing, you may remember seeing Alex’s kart on display in the Lucas Oil Display inside the front gate. In 2014, it will be staffed by his dad and Jeff’s second wife Rhonda. Rhonda’s son Brayden will be helping Alex and Jeff in the pits too. Alex’s dad Jeff was the one who signed him up for kart racing and Jeff still remembers his son’s first time on the kart track 8 years ago. As excited as Jeff is about their new move to Saturday Nights, he is just as excited about his new involvement in karting, he has taken on the role of Kart Race Director this season. Alex would like to thank everyone that has helped him with his karting and his move to the 4 Cylinder Division – his Dad Jeff, Chris and the Watson family, Evan and Baden Curtis, his stepmother Rhonda. Alex couldn’t do any of his racing without the support either without the support of companies including Brian’s Tire Repair, Henley Honda, Pirie’s Appliances, Mr. Transmission, Drummond Home Hardware, Thorold Auto Parts, Pizza Jerry’s, the Merrittville Kart Club and the Betheny Youth Nation – a youth club at his church. Good luck from Henley Honda! From all of us at Henley Honda, we want to wish the best of luck to Alex and his family for this racing season! He’s a great kid and a great driver, we can’t wait to see him succeed on the race track!